So I am super excited. 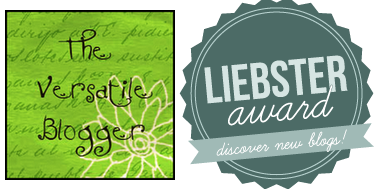 I have been nominated for The Liebster and Versatile Blogger Award by the lovely Rachael from 5'1 is the new 6'2 http://thenew62.blogspot.co.uk/. I haven't been blogging for thaaaaaat long yet and I am still waiting for the hordes of followers, COME ON PEOPLE FOLLOW ME :) But it is nice to get some recognition, and especially from someone with such an interesting and addictive blog as Rachael! One of things that drew me to blogging was, what I perceived as, a really friendly blog-a-sphere. I wanted to be able to talk about my passions with similar minded people, and find someone other than my boyfriend to bore to death with my beauty ramblings! And I hope this nomination is the first step towards that goal! - No tag backs! - Easy - enjoy! - If you are nominated, you've been awarded the Versatile Blogger award. - Next, select 15 blogs/bloggers that you've recently discovered or follow regularly. - Nominate those 15 bloggers for the Versatile Blogger Award with a link to their blog. - Finally, tell 7 things about yourself. I don't buy ANYTHING beauty related without reading reviews first. So I wanted share my opinions and passions with those like minded kindred spirits! I also thought it would be a great way to make some new friends. Awwwww. 2.Hair care or make-up if you had to pick one? Make-up. It's my Achilles heel. Thinking of the amount money I've spent in Space NK makes me feel more than a little nauseous. 3.If you could pick any city for a night out which and why? Manchester. It's where I went to Uni and most of my friends are still there. It has got such a different vibe to London, much more laid back and MUCH less pretentious. There really is a night out for whatever mood you're feeling. Depends on the night. I love heels. I'm tiny, barely 5 ft 2, so I love feeling the same height as everyone else and being able to talk to their faces rather than chests, or stomachs in some cases! BUT I always end up taking my heels off, I have such a low tolerance for foot pain, and my boyfriend always end up carrying them! I think of my heels are pieces of art, so If I know the night is going to be scummy and there is any chance of ruining my little babies it's flats all the way! 5.Your BIGGEST annoyance about blogging? People not following me! Someone be my friend! Ummmm. I really don't know If I can choose just one. I tend to black out on nights out, waking up with NO memory of the night before, so I think that question is better directed at my friends! 7.Can you speak any other languages, if so, what? If not, do you want to? No! Shamefully I learnt French from 4 till 16 and still can't communicate much more than bonjour! I do know how to say my leg hurts in German if that counts for anything?! I would love to learn Italian I think it's such a romantic language. If you do X for me I'lll love you forever. It really has helped me get my own way ALOT! Working in beauty PR, and I am currently interning doing exactly that so hopefully I am on my way! Sadly no. Am I missing out?! 1. If you had to choose one beauty holy grail what would it be? 2.If you could live in one city in the world where would it be and why? 3.Are you Team Edward or Jacob? 4.Do you watch the Real Housewives? If so what's your favourite city? 5.Do blondes have more fun? 6.Would you rather be boiling hot or freezing cold? 7.The Kardashians- yay or nay? 8.Are you a dog or cat person? 9.What's the most fulfilling thing you have ever done? 10. If you got given £1000 what would you spend it on? 11.Any beauty tricks to share? Thanks for the lovely comment on my blog, I love yours and would love to follow each other! Do you have Google Friend Request?